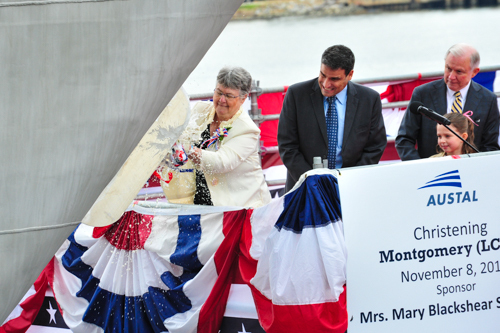 Austal USA and the US Navy celebrated the christening of the future USS Montgomery (LCS 8) this morning as ship sponsor, Mary Blackshear Sessions, broke the ceremonial champagne bottle on the bow of the ship in Austal’s shipyard in Mobile, Alabama. 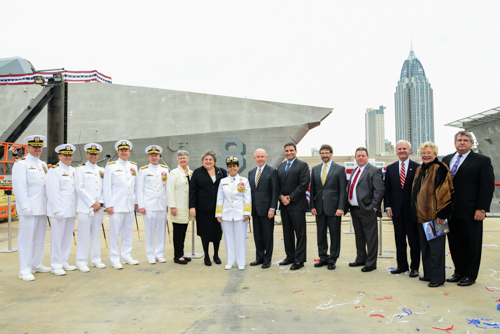 Montgomery was the second Independence-variant Littoral Combat Ship (LCS) christened at Austal USA this year and the second ship named for Montgomery, Alabama. The Independence-variant LCS are 127-meter (419-foot) aluminium trimarans, capable of being outfitted with reconfigurable payloads (mission packages) which can be changed to support mine countermeasure, anti-submarine and surface warfare missions. The vessel has a maximum speed of more than 40 knots. Montgomery was launched in August and is making preparations for trials and delivery late next summer. Navy tradition dictates that each ship constructed for the service be honored on four historic ceremonial occasions: keel-laying, christening, commissioning, and decommissioning. When a Navy ship is christened, the recently constructed ship is solemnly dedicated, named, and committed to the sea. Mary Blackshear Sessions, the wife of Senator Jeff Sessions (R-Ala.), was born in Montgomery, Ala., and grew up in Gadsden, Ala., graduating from Gadsden High School. She attended Huntingdon College in Montgomery, earning a degree in Education in 1969. Mrs. Sessions married Jefferson Beauregard Sessions III, on August 9, 1969. The Sessions have lived in Mobile, Ala., for 39 years and have three grown married children and nine grandchildren. Their son-in-law, Paul Reinhardt serves as a Commander in the U.S. Navy. Mrs. Sessions attends Ashland Place United Methodist Church where she is a member of the Prayer Shawl Ministry. In Washington, D.C., she is a member of the Senate Spouses Club, The Republican Congressional Spouses, The Congressional Club, and the Senate Spouses Book Club. She is also a member-at-large of the Daughters of the American Revolution (DAR). When her grandson was born with a birth defect called Congenital Diaphragmatic Hernia (CDH), Mrs. Sessions became active in bringing greater awareness of this birth defect to the public. She was joined on stage today by her seven-year-old granddaughter, Maid of Honor, Miss Jane Ritchie Reinhart. Over 400 naval and shipyard guests attended the ceremony, which was held on the east bank of the Mobile River at Austal USA’s waterfront facility. Admiral Michelle Howard, USN, Vice Chief of Naval Operations was the principal speaker at the event. The LCS program is in full swing at Austal USA with six ships under construction at this time. Jackson (LCS 6) is preparing for sea trials in early 2015. Final assembly is well underway Austal USA’s Bay 5 on Gabrielle Giffords (LCS 10) and in Bay 4 on Omaha (LCS 12). Modules for Manchester (LCS 14) and Tulsa (LCS 16) are under construction in Austal USA’s Module Manufacturing Facility. Austal USA has been contracted by the U.S. Navy to build ten 103-meter (338-foot) Joint High Speed Vessels (JHSV) under a ten-ship, $1.6 billion contract, two of which have already been delivered, and ten 127-meter (419-foot) Independence-variant LCS class ships, eight of which are a part of a ten-ship, $3.5 billion block buy contract. For the LCS and JHSV programs, Austal USA, as prime contractor, is teamed with General Dynamics Advanced Information Systems. For the LCS program, General Dynamics is the ship systems integrator, responsible for the design, integration and testing of the navigation systems, C4I, and aviation systems. Austal USA is a full-service shipyard offering design, construction and high-speed vessel service and repair. As Austal USA continues to expand its service and repair capabilities, the company is well-positioned for new business with engineering, test and trials capabilities, a new west coast operations office in the San Diego area, and a new waterfront facility on the Mobile Bay waterfront.